Although Krav Maga incorporates moves that can be found in other martial arts such as Boxing, Savate, and Muay Thai (punches and kicks) or Jiu-Jitsu, Judo and Wrestling (grappling and disarming techniques), its training is severely different. This is because Krav Maga stresses self-defense during worst case scenarios that may happen in real life (e.g: against armed or multiple opponents). 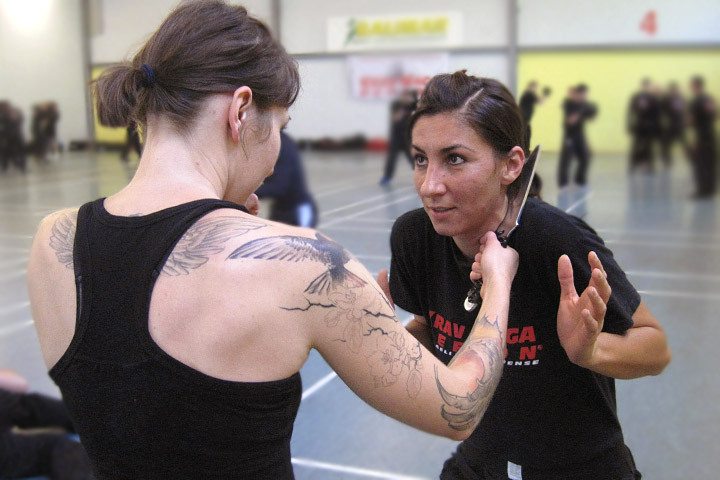 Below are three examples of potentially life-saving moves that you’ll master and have at your disposal when you train in Krav Maga. Notes: Please do not attempt to emulate these moves without the guidance and supervision of an experienced practitioner! Though this move looks simple, when done correctly, it can neutralize an attacker quickly so can get away or go on the offense with another move. Similar to boxing, you would use your fist as a ‘weapon’ where the power comes from the bending of knees and a hip twist as your fist is targeted to the chin of the opponent. If your attacker happens to be beside you, this is a great move to distance yourself from the attacker. Begin by crossing your leg to the direction of the opponent while shifting your weight to your leg. Slightly twist your hips and end with a kick using your heel. This move is most effective when targeted to the abdomen, knee or shin.